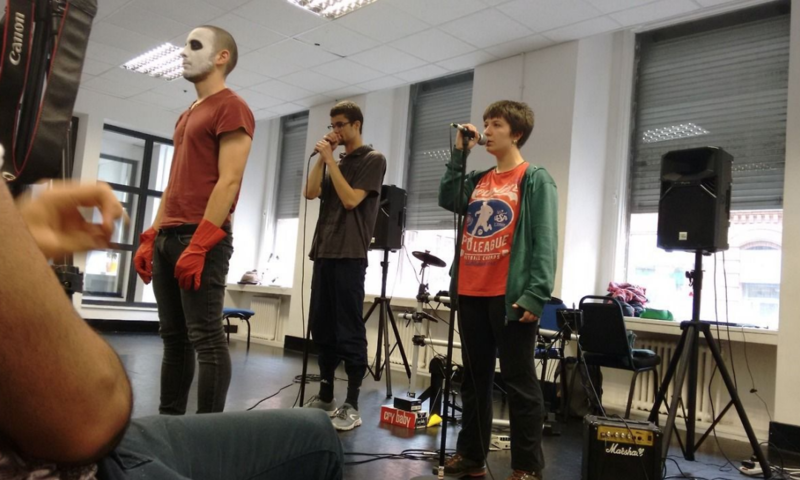 On Monday, I formed the plan for my individual performance to be presented in the final show. The idea for this performance came to me one night when I was struggling to fall asleep, I initially made a brief note of it and presented the concept in a group sharing on Friday of the previous week. My focus for this day was on creating the structure for this performance. In the afternoon we had a group session led by Cristina. In relation to something she presented previously during a sharing of Steph’s tasks, she requested that we pair up, leave the studio and one person in the pair ‘stalks’ the other person as they walk around the city centre – the stalker recorded this footage on a device, which was later put together along with the other stalkers’ footage and edited on a computer. It was agreed that the resulting video is to be used in the final performance, with perhaps a fabricated story behind it. On Tuesday I worked with fellow Under25 artist and musician Bill, creating drumming tracks for his composition ideas to be presented in the show. Paula led the group session in the afternoon. She started by playing a video to the group, showing dancers known as the Batsheva Dance Company doing a series of movements, all synchronised with each other. After the video, she taught us a series of movements to be done synchronised as a collective, similar to the video we watched – we agreed that this should be practiced daily and presented in the show. On Wednesday Fay led the group session. She had everyone to speak about what Under25 means to them – it did not have to be complex and look deeply into the apects of the project. The group came up individually with brief statements and questions about the project, which Fay listed on a spider diagram with Under25 in the center. We then got in pairs to combine our thaughts into something presentable, and finally got into two big groups to to combine all of the groups’ thaughts which we then had 2 showings – the first was an open questioning and the second was a short cover and performance of ‘My Generation’, implemented with being under 25 and the chorus first being spoke in English, then in Spanish and Portuguese. On Thursday I led the group warmup session, doing an exercise that looked at the group being controlled by puppeteers, which everyone did puppet-like movements based on a limb that was called out to them. For Pedro’s group session, we again got together as a collective and recited an extract from a poem by Dante stepping through the gates of Hell. This required everyone to speak in time and tone with one another, which we again agreed to practice and take to the final performance.